Diana Doublet is passionate about music, libraries, and especially the intersection between the two. Hailing from Calgary, Alberta, she has degrees from both coasts with a Bachelor of Music from the University of Victoria, and a Master of Library and Information Studies from Dalhousie University. 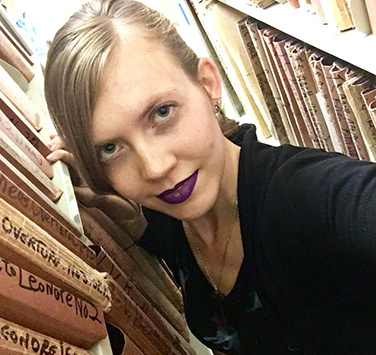 She has participated twice in the Tafelmusik Baroque Summer Institute, where she was introduced to and subsequently fell in love with music sourcing and orchestra librarianship. Her library experience includes work in the Calgary Public Library, the Canadian Architectural Archives, University of Calgary Libraries, Saint Mary’s Archives, and Dalhousie Libraries Special Collections, and volunteering with Symphony Nova Scotia’s previous librarian. She is thrilled to now be stepping into the position full-time. Since moving to Halifax in 2015, Diana has involved herself in the music scene as both avid concertgoer and community musician. She is a member of the Chebucto Symphony Orchestra, and has also played with Nova Sinfonia and the Dalhousie ensembles. She lives with her cat, Clara (after Clara Schumann), and her partner, Matt (who came with the name). Do you play an instrument? Why did you start playing your instrument? Yes! I have a Bachelor of Music in oboe. I started on clarinet in Grade 7 band, but decided I wanted to play something no one else did and switched to oboe the next year. I had no idea what I was getting myself into… But in all honesty, I love the oboe, and I love that there are so many opportunities for me to still play it here in Halifax. I always have a couple books on the go (feeding into librarian stereotypes, I know). For fiction, I’m reading the final book in Ferrett Steinmetz’s ‘Mancer trilogy: a super cool fantasy thriller about magic as obsession. For non-fiction, Colin Dickey’s Ghostland: an exploration of American ghost stories and the history that inspired them. I’m dangerously fond of colourful lipstick. Purple is my favourite, but I like to experiment across the whole colour spectrum. It brings me great joy to have my lipstick perfectly coordinated with my outfit!